Reviewed on Xbox One, copy supplied by publisher. Hello Neighbor really resonated with me. I’d spent the last weeks of 2017 moving homes and coupled with a particularly busy holiday period, the experience took longer than expected and resulted in stress, frustration, and a little loss of sanity. Just like playing Hello Neighbor. 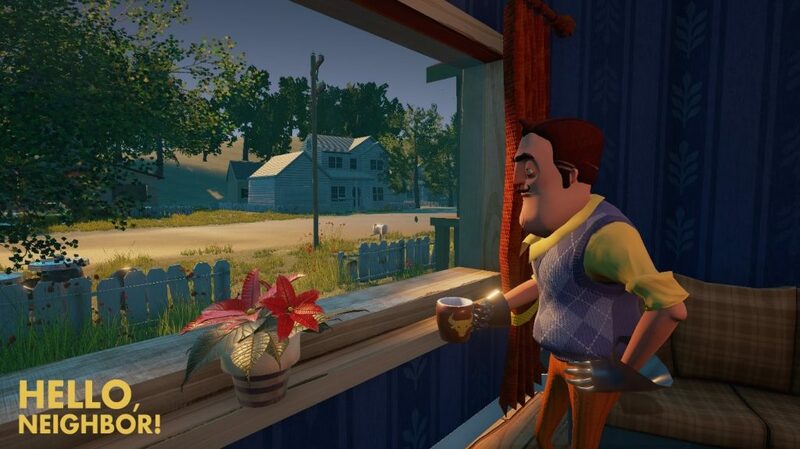 Hello Neighbor is a puzzle-based survival horror game that begins with a boy running down his street, only to hear screams coming from the house across the road, owned by a suspicious (aka moustached) man. Rather than call the police, the boy’s best course of action is to break into the house and discover what lurks within. 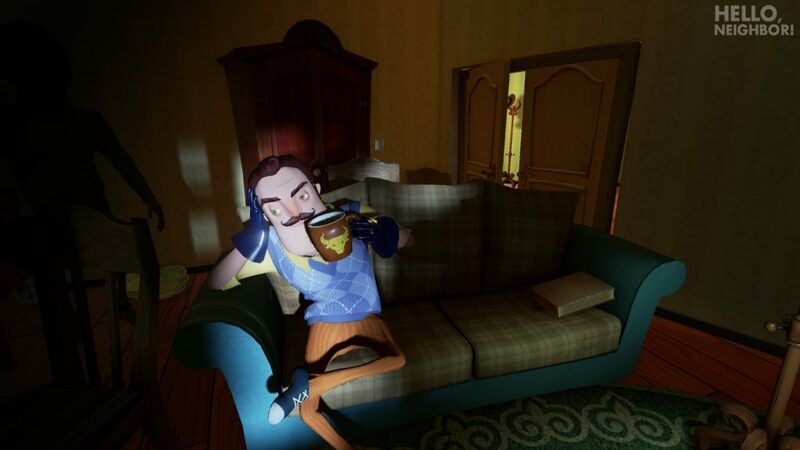 The storytelling is the most interesting thing in Hello Neighbor. There’s essentially no dialogue, instead using the environment to show the story’s progress, and enhance its absurd premise and surreal finale. You play through some narrative vignettes after failing too many times (trust me, you will), which should feel out of place, but add to the backstory of the neighbour. They’re simple and short, but surprisingly effective for a game like this. But that’s pretty much where the good things end. Though his moustache is still fabulous. While a few puzzles are quite clever with multiple possible solutions, the puzzles in the third act were very obscure. An example was one room that required having to look at a random painting and rearrange the room to match the painting. There was no logic to that and little to indicate that was how to progress. It felt like I was going insane as I walked through and reinspected each room for the twentieth or so time, trying to figure out what to do next. There needs to be some kind of hint system or way to draw attention to vital things. The Witness manages to draw your attention, with distinct colours indicating important areas. That’s what prevents much of the confusion and frustration. But to finish Hello Neighbor I had to consult guides to finish the game after hours of wandering, lest I be lost to the labyrinth forever. This house has a few storeys to tell. Then there’s the addition of the ‘Fear Rooms,’ short mini game-esque levels interspersed within the final act that take you out of the house and into a standalone area. An interesting idea, but they’re rough and unnecessary to the game. I still don’t know what the deal is with the mannequins. 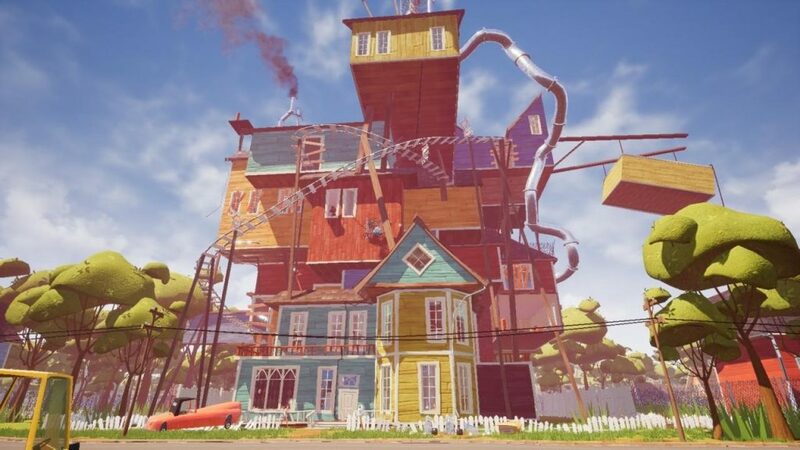 Of course, you need to explore and search for clues all while avoiding the titular neighbour, who is meant to make the game feel like Alien Isolation in suburbia. But the Alien works in Isolation because you can use your motion sensor to detect when it’s nearby to better hide from it. 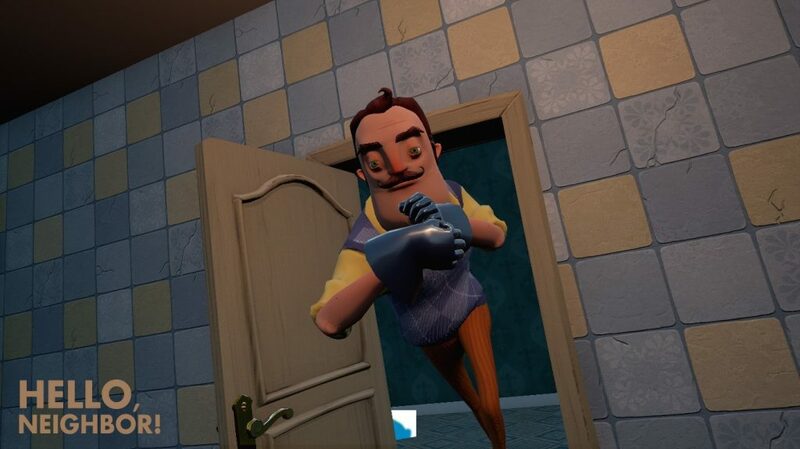 Hello Neighbor simply gives you an increasing sound effect when the neighbour is close, but you have no idea if he’s in front or behind, so you’re just as likely to run into him when you’re trying to hide. The neighbour can set up defences against you by placing beartraps at doors or boarding up windows, and he’s smart enough to do this in places you most often access. 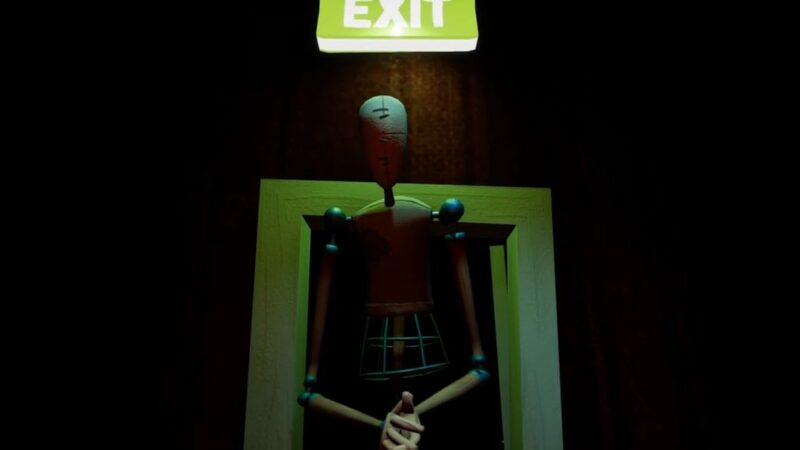 Unfortunately, he’s a little too smart, and after failing many times you’ll find rooms with five security cameras on one wall or bear traps at every other door. Hmm, how can I make this game even more nightmarish and annoying? Numerous glitches also plague the game. During an early section of Act 3, the game would randomly freeze, forcing me to try and speed run that area to avoid resetting another time. Later in the act, I exited a cart only to be transported to the top of the level, potentially allowing a huge shortcut had I not opted to jump back down. Later the cart teleported me under the map to fall to my death. Thanks cart. The game is almost impossible to finish without help. Only 2.71% of Xbox players have earned the achievement for completing the game at the time of writing. I wonder how many managed this without guides. Perhaps this mess of a game is the result of being in early access too long, as once the community figures out a puzzle, it’s hard to make small adjustments. You can see huge differences between the earlier trailers and final product. It’s not fun to run in circles not knowing what you’re looking for. It’s not fun to try and run from the neighbour only to run into him instead. A shorter, and cheaper game (something early trailers indicated), may have been an engrossing experience, but this is packed full of wasted potential. I may have finished moving, but Hello Neighbor feels like it has too much to unpack. 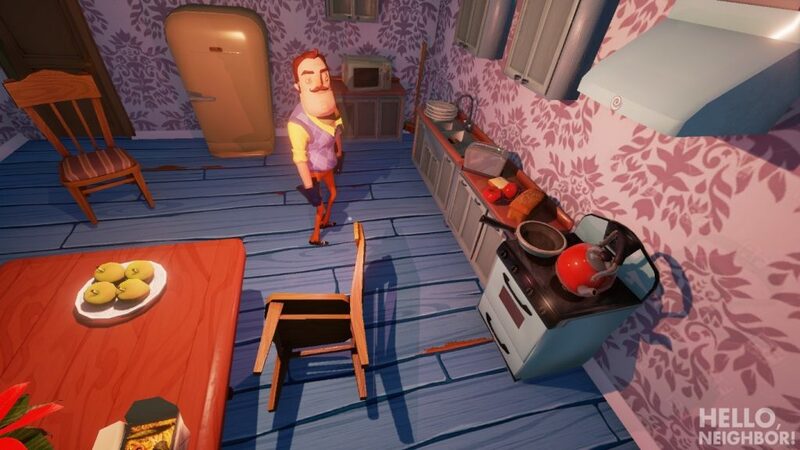 Hello Neighbor is a fun, goofy concept that’s housed in a rough and arduous game of treasure hunt. The game’s relatively short length is artificially increased due to confusing and difficult environments. If you insist on finishing this game without guides, the retail price of $50 will provide many hours of running in circles.